This is NOT the official web site for Melbourne's Thai Temple, Wat Punyawanaram. This web site, Melbourne Thai Temple, was created to share general public knowledge of the temple and its special events. Our content does NOT reflect the official opinions of the Monks or Board of Trustee of the Wat. 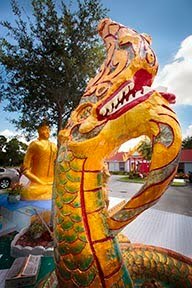 Our site, Melbourne Thai Temple, strives to provide timely and accurate information to the best of our ability, and visitors to this site should contact the Wat (321-255-1465) for clarification of any conflicting information and/or dates. *** Questions or concerns about photos or videos, contact me directly, the Temple has no way to access this secure site. Want to know about upcoming events at the Temple...follow us on Facebook. returns to Every Sunday again! The Wat provides a serene location for its members, guest, and visitors to learn and practice the teachings of Buddha, learn the art of meditation and chanting, and to act as a social center for its members and guest to enjoy the holidays and customs of the Thai people.